There are different sorts of a toaster oven with various component and functions, choosing the right one that suits your need is a tricky task for you. Our best toaster oven reviews bring up the best 6 toaster oven list for you to buy the best toaster oven that will fulfill your demands. A toaster oven is a kind of cooking gadget that allows you to perform several cooking methods at the same time. It ensures you a quick process of cooking in a comfortable way. With this space-saving appliance, you can instantly cook a tempted food for your family. Some of the toaster ovens are equipped with various types of functions and features can perform several terms of cooking at the same time. 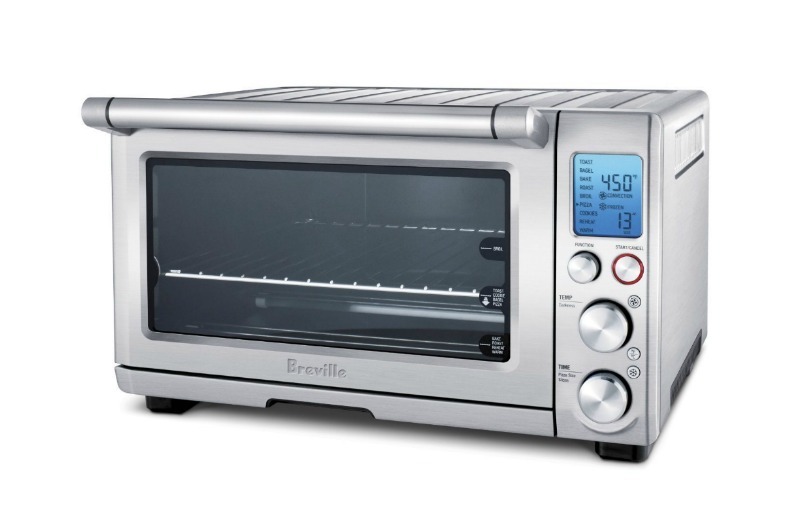 If you afford a good amount of budget for a toaster oven and have enough space in your kitchen, then go for Breville BOV800XL. This toaster has built in IQ technology. It also has five quartz heating element that can produce 1800-watts of heating power. This toaster oven is quite large, so you have to have the minimum gap of 4 inches on both sides. This toaster oven can cook, reheat and also bakes yummy pizza pies and roast succulent meat quickly. The backlit, it is easy to notice the LCD changes, it turns orange to blue while cooking and preheating. This toaster features nine cooking presets like cookies, roast, broil, pizza, bake, bagel and toast, reheat and warm. The body is made of stainless steel and has a non-stick surface interior. The functions of this toaster oven reduce the cooking time up to 30 percent. There is a magnetic auto ejection rack which pops the foods halfway out; it makes easy for you to take the food out of the oven. It is provided with a 1-year warranty. 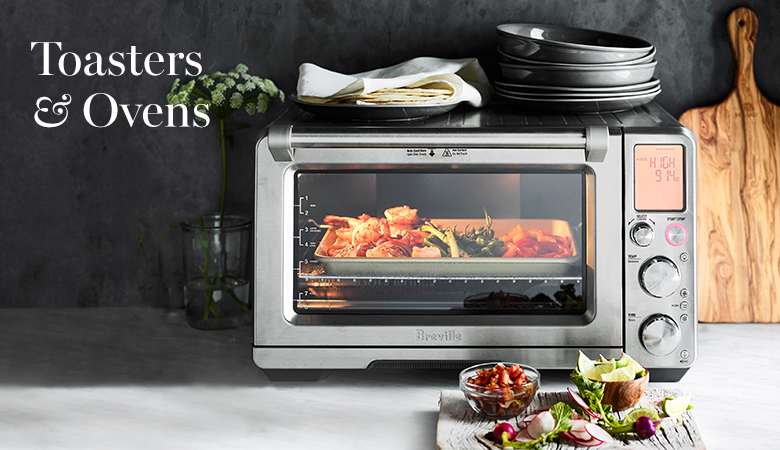 Above all, the heating system of Breville BOV800XL Smart Oven is a good one that cooks food quickly and also comparable to the other toaster oven.The preset cooking system assumes you to select the best settings for the food you want to cook. 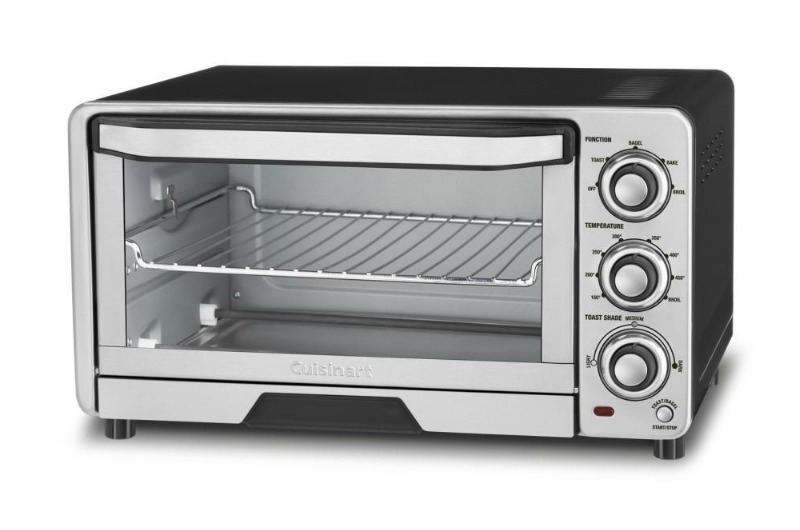 The Cuisinart TO B-40N came with an authentic design and furnished with stainless steel, a cool-touch handle, and a glass door.Toaster ovens get too hot to take out the food, the cool touch handles and a removal crumb tray eases the task for you. The slide out rack is to load and unload the foods. Though you have to face some problem to read the functions, the dials are made of rubber, and those are easy to grip. 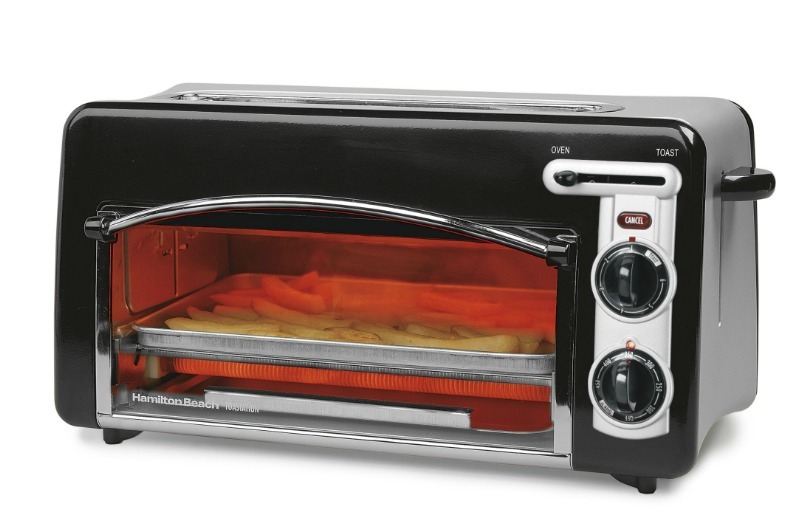 It produces 1800 watt off heating power and has the setting of the bake, toast broil, and bagel. You can toast 6 slices of bread and bake an 11-inch pizza in it. The shade control technology always makes it easy to toast the bread. The coated non-stick interior eases the cleaning process. You will get baking/drip pan and a broiling rack with it. The Cuisinart TO B-40N Classic Toaster Oven Broiler has an automatic turn off system which very safe in case of dangers and accident. In a word, it is an excellent cooking stuff for you to have an exceptional cooking experience. 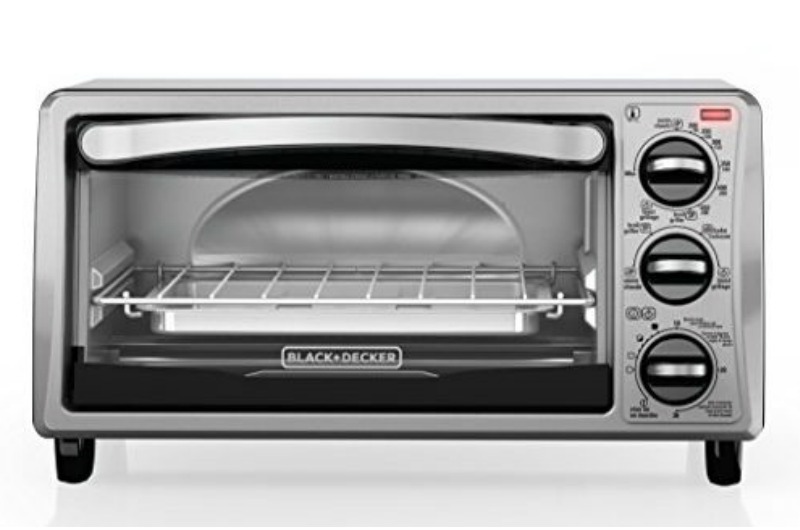 The BLACK+DECKER TO1313SBD 4-Slice Toaster Oven toasts 4 pieces of bread at once.Though it is smaller than the others, can bake a 9-inch pizza. This ordinary toaster is made stainless steel. It has been outstanding, it provides a great heating power and cooking performance even with one heating element at the top.This toaster oven features a 30-minute timer with specific functions. It has a great feature of keeping the food warm; a stay on setting keeps the oven warm after the timer ends. You can see the whole cooking process through its durable glass. It comes with a toasting rack, a broiling pan, and a baking pan. You can keep the two pans inside this toaster oven when the are not in use. To ease your cleaning it has removal crumb tray. The primary 4 function of this toaster are; warm, broil, bake and toast. During the warm or broil mode, only the upper heating element works. If you use the toast and bake modes, both of the heating element is turned on. There is a plastic knob to prevent you from keeping it too close to the wall. For a clean, tidy kitchen the BLACK+DECKER TO1313SBD will be the best one for you.To broil small items this toaster oven is an ideal one. Shortly, if you prefer a small toaster oven then go for BLACK+DECKER TO1313SBD 4-Slice Toaster Oven without any hesitation. 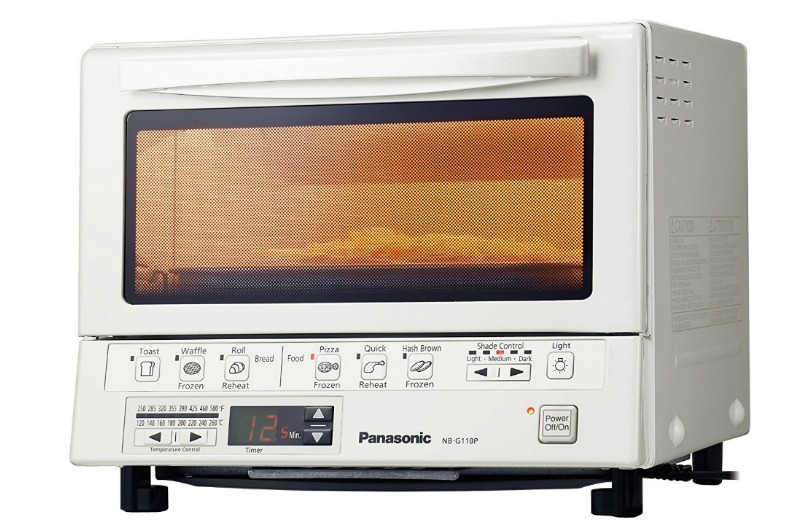 The Panasonic NB-G110P look like microwave oven more than a toaster oven. The function of this toaster oven beyond your imagination. The oven features an inbuilt Flash Xpress technology which cooks the food 20 times faster than the other toaster ovens. It has a small footprint, so you do not have to worry about space, it will fit your kitchen easily.The square tray of this toaster can assume 4 slices of bread or a 9-inch pizza. The massive heating power of this toaster oven is the main attraction for you. The display will show you the temperature inside the toaster. This oven automatically calculates the perfect temperature for the variety of foods. It features six preset cooking function that has illustrated buttons. There are 8 heating levels with a temperature of 250˚ to 500˚ which gives the exact amount of heat that’s applied to food. Soft touch buttons are given to set the temperature. The bright digital timer allows you to adjust the cooking time up to 25 minutes. A beeper let you know the time the food is ready. An interior light assumes you to see the cooking process, just press the button to turn it on. It has a non-stick interior and also a front removal tray which is easy to clean. This smart toaster also has other baking elements for cookies, pizza, and cakes. In a word, the Panasonic NB-G110P Flash Xpress Toaster Oven is a handy one which automates your cooking time and makes the cooking experience a bit easier for you. 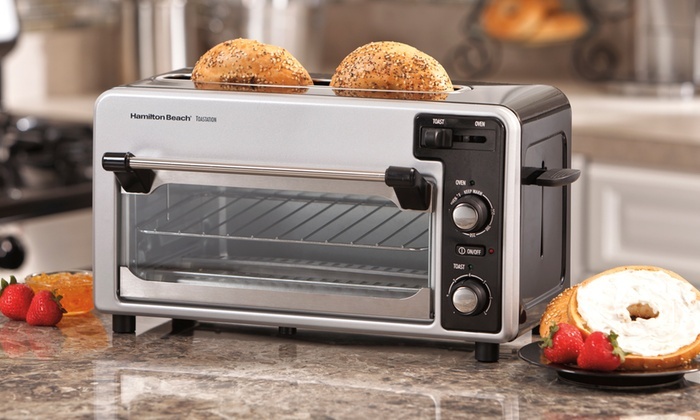 The Hamilton Beach 22708 is a dense 2-in-1 toaster and mini oven that does not take much space in your kitchen room. The Hamilton Beach 22708 will save time as well as energy. 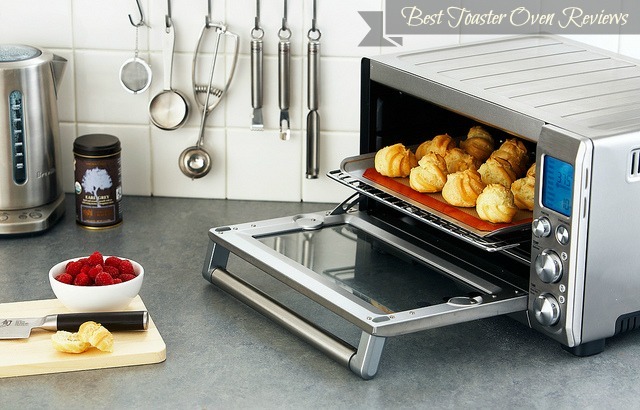 You can use this toaster oven to heat fresh or frozen pastries, waffles, bagels, bread or pizza quickly. The inner part of the oven is for baking or reheating chicken nuggets, pizza, appetizers, etc. 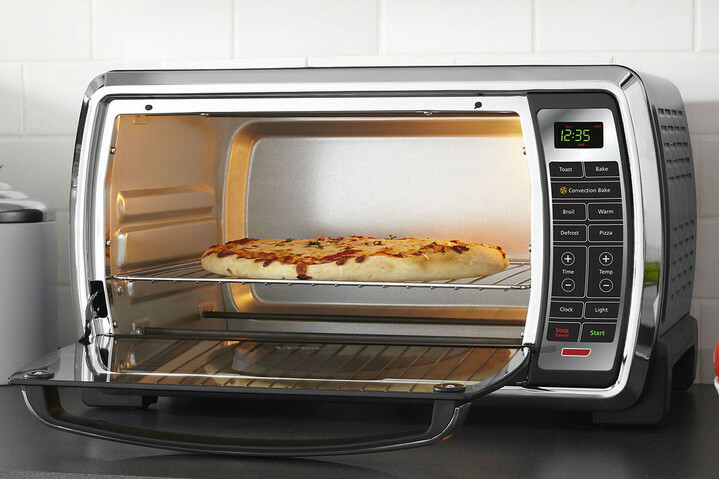 This toaster oven can handle two 16-inch slice of pizza or two 5-inch pizzas. You can toast two pieces of bread and make a delicious pizza at a time. Electronic toast shade and oven temperature controls ensure balanced results every time. Slide function lever has two regulators to one to regulate the temperature of toasting and baking. An automatic shut-off system reduces the chances of accidents. There is an extra-wide bread slot to bake a thick bagel, an English muffin or a pair of hot dog buns. This toaster oven uses less energy than the other models. It can toast 24% faster comparable to the other toaster. It has a vintage look which seems like an old style radio. The body size is small, so it will not make you worry about where to place it. Hamilton Beach 22708 Toastation Toaster and Mini Oven fulfills the need for space economy and have a perfect solution for many busy cooks.The versatile cooking performance and multitasking ability made it different from other toaster ovens. 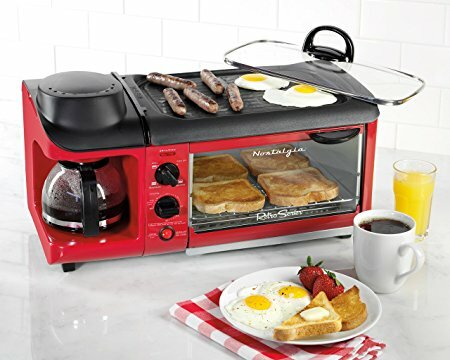 Shortly, this one is perfect for small spaces and eliminates the need for both a toaster and a toaster oven which will help you to make breakfast in the morning as well as dinner at the night. Conventional ovens are not very efficient to cook big meals for a family feast. The Oster TSSTTVDGXL-SHP Digital Countertop Oven is capable of handling more than a conventional oven can. It is an exceptional and a tremendous addition to your kitchen room. The Oster Digital Countertop Oven will be the best choice for you to cook a big meal for your family. It has an extra large interior which let you cook a proper food for your family time. You can easily put a 16-inch pizza inside it. It can bake, broil, toast, and also defrost. The large interior allows you to cook a chicken as well as a turkey chicken. It has 90-minute timer without auto shutdown. This oven is an energy saving oven which saves energy comparable to the others. Its saves more energy than a conventional electric oven. Brushed with shiny stainless steel which gives it an attractive look. Soft function buttons to operate the cooking process. The turbo convection technology ensures to cook the perfect meal. Provided with 2 oven racks, durable bake pan, and integrated broil rack. The Oster TSSTTVDGXL-SHP will help at the time when you need to cook a big dish, but you have a short period and don’t have space in your conventional oven. In a word, this extra large unit will give you a passionate cooking experience and will allow you to serve your food with pleasure. This buying guide provides all the necessary l information about the things you need to figure out before spending money on a toaster oven. 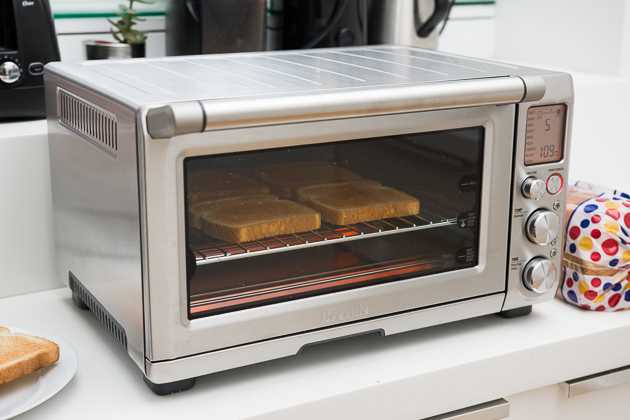 A toaster oven can use to warm/ reheat foods, roast, brown, broil, bake, and toast. You can even use a toaster for toasting bread products like bagels. You can reheat leftovers in it without making them soggy, but a microwave-oven make them wet. Microwaves feature fast, convenient cooking and warming performance, but they can’t cook as a toaster oven. A toaster oven is ordinal to a microwave oven, a pop-up toaster, and a conventional oven. If you are in lack of space, you can use a toaster oven instead of a microwave oven, a pop-up toaster or a regular oven. The little space inside the toaster oven allows it to reach a high temperature faster than a microwave oven. The leftovers that you reheat in a toaster oven are more fresh, where a microwave oven make the leftovers half burnt and also sloppy. Cookies and muffins that you bake in a toaster oven are more freshly baked than those you bake in a microwave oven. Toaster ovens take a long time to heat leftovers than a microwave oven, but your waiting won’t be worthless. Except for boiling water you can use a toaster oven for all other heating tasks. Toaster ovens with convection technology provide faster browning and cooking. It defrosts the frozen foods. A toaster oven with convection is cheaper than a conventional oven which has convection. A toaster oven with a bagel mode usually makes bagels that are more delicious than those made in a typical toaster. If you serve a large number of people, you can cook side dishes in a toaster oven if you cook your main course in a conventional oven. A toaster oven can control lower temperature than a conventional oven, and the keep warm function is very useful while you are cooking various dishes. The capacity of a toaster oven is less than a conventional oven. 8×8 inch size pan or half batch of cookies. The capacity of a toaster is little, so it becomes harder to cook food for more than two people. A toaster oven takes twice as long for making a toast than a slot model, but you can bake multiple pieces of bread at once. Some of the toaster ovens may toast bread inconsistently as compared to a groove model, but many people do not notice this. While baking several slices of bread at a time, the sides of the bread will be light, and won’t get the perfect color or texture. You have to practice to cook a perfect frozen meal in a toaster oven. You can’t heat up a mug full of tea in a toaster oven, but you can do it in a microwave oven or a conventional. There is a wide range of toaster ovens with variety specifications and feature are now available. Once you know about the different sorts of toaster ovens there different specifications and functions, you can decide the best to invest on the best toaster oven which is suitable for your needs. You can place a countertop oven at the top of your kitchen countertop. You can also mount them under a cabinet. If you have a kitchen with a little space available, then you can buy a toaster oven which has small footprints. Normally, for your basic needs like warming, toasting and baking the toaster that you use is a standard toaster oven. To maintain a steady temperature, the coil of these toaster ovens turns on and off by thermostats. It contains a digital or manual controls with a timer that allows automatic shut off and also a broiling feature. 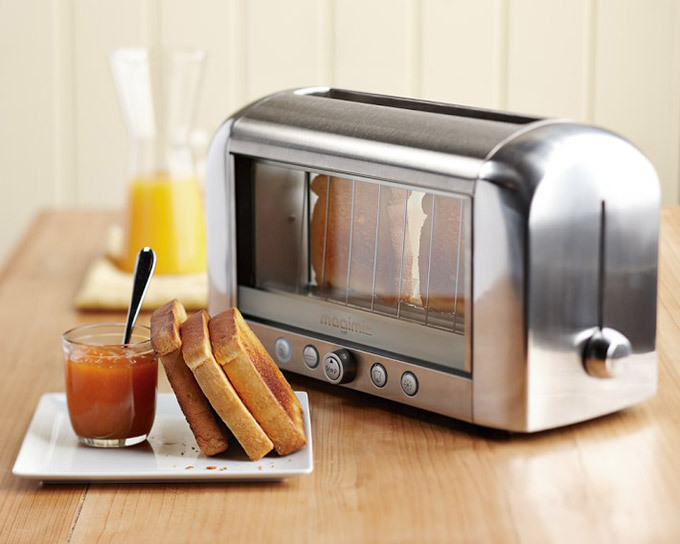 Maximum standard toaster ovens can toast 2 to 4 slices of bread at once. Some of the ovens can toast 6 slices of bread at a time. These toaster ovens have a push lever like a pop-up toaster and also an adjustable darkness controller. Some models have an automatic ejection tray which slides the food out when the food is ready. There is also some standard oven with an ejection tray which slides the food out after opening the door. A convection toaster oven features a lot; it has a fan on the inside that blows hot air over the food while cooking, this prevents the formation of spots on the food and also makes the foods browner. It cooks fast which allows you to set a low temperature and helps you to save energy. A toaster with conventional or convection settings allows the users to use some advanced features and also more cooking options. Infrared toaster ovens heat food directly. It does not use the surrounding air to hit it. These type of toaster ovens will provide you with tempted crispy and brown foods. The infrared ovens heat the foods so fast that you don’t need to preheat it. Infrared Toaster ovens are energy efficient than the others for its faster cooking performance. It cooks 50% faster comparable to the other ovens with regular heating coils. You don’t have to defrost the foods before cooking it. Many of the infrared toaster ovens look very different as compared to the usual toaster ovens. Some offer preset options which are very efficient while the kitchen time. 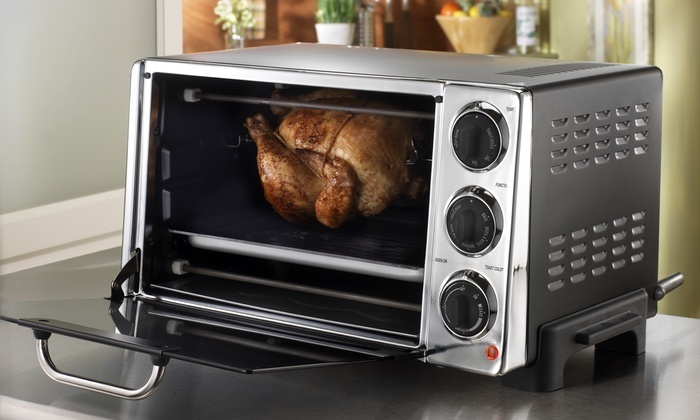 Rotisserie Toaster ovens come in a variety of capacities, and they are capable of cooking between 1 and 4 chickens at the same time. Bigger models have the ability to cook a turkey. Regular ovens added rotisserie cooking as a quality feature, where toaster ovens include rotisserie cooking feature as a special one. Some ovens are made to use it only for rotisserie cooking. However, a rotisserie is a standard addition to a toaster oven. High-quality models often combine convection with rotisserie cooking ovens offers standard or convection cooking system including the infrared rotisserie feature. A combination toaster ovens are put together with a usual convection toaster oven and a pop-up toaster. There is also some model which features a toaster along with a coffee maker. A small frying pan is added on the top by which you can cook bacon, eggs, toast bagels and bread, and brew coffee at a time. One of its models has a steamer on the top of a toaster oven included with another steamer in a frying pan, toaster oven, and coffee maker. One model features a grill press for meat or sandwiches, and another combines a rotisserie with a steamer and a toaster oven. Most of the toaster ovens provide temperature settings similar to those featured in a regular oven. This setting allows you to set the temperature of the oven according to what you want to cook. A timer lets you choose the amount of time you want the toaster oven to cook. The timer is useful while you use the bake, broil and toast options. If the toaster oven doesn’t have the timer, the shade setting will help you as the timer does. While cooking, an interior light makes things easier for you to have a clear view on your food. You can not only monitor the status but also prevent the foods from getting burned before taking it out of the oven. With a bright display, you can easily see the functions at a glance. Some of them feature to show you the date and time, shade settings and the remaining time. The shade is to maintain the quantity of shade or dark you want on your toast. You can control the settings the way you want your toasts to be. A toaster oven with a reheat warms up the leftovers without making it soggy. The leftovers will not lose its crunchiness; it will remain the same as before. The microwave oven makes the leftovers soggy where the toaster oven doesn’t. A defrost system an extra addition to some of the toaster ovens.The defrost setting helps you defrost your toasts instantly. If you tend to keep your foods in a freezer, then search a model that defrost your foods. A toaster oven which has a nonstick interior is much easier to clean. Some foods get bubbles over while cooking if you don’t have a toaster oven with a nonstick interior you will have to face difficulties through your cleaning process. Nonstick interior allows you to clean with ease. A baking pan and drip pan are given with most toaster ovens. If they are not provided, you have to buy the right accessories because the containers of standard ovens won’t fit perfectly in the toaster ovens. A crumb tray which can easily be moved from the exterior of the oven to empty it while the oven is hot, so why you will have to lift the oven to reach the tray. Buy a toaster with a removal crumb to ease the clean. Automatic shut-off system is an innovative technology which turns the oven off after a period of 40 to 60 minutes. It is a very useful feature that prevents accidental fires. It’s much comfortable to remove food if the oven has auto-eject racks that slide out the food halfway when you open the door of the oven. It’s quite tough to pull a hot dish out of a toaster oven which does not contain such feature. A toaster oven that has the feature of audible alerts or beepers will let you know the time when the food is ready. Check if the beeps are loud enough so that you can hear but not so loud to disturb you. Some of the toaster ovens feature some preset options for some specific dishes. You can preset the cooking option and relax until the food is ready. It is an exceptional addition to the modern toaster ovens. It detects the atmosphere inside and cooks the food itself. You will look for a toaster which gives you an easy and comfortable user experience. Mix up options increase the complexity and frustration. A good toaster oven should look simple and have easy readable controls and features. • Consider the quantity of food you usually cook. Besides, you will also have to think about the number of people you cook for. • A toaster oven which can contain 2 to 4 piece of bread is a perfect one for your small family. • If you have a family with a large number of people, then you should select a toaster oven that can hold 6 slices of bread at the same time. • A small toaster can handle little cooking, but the big ones can cook big size pizza or a whole chicken. 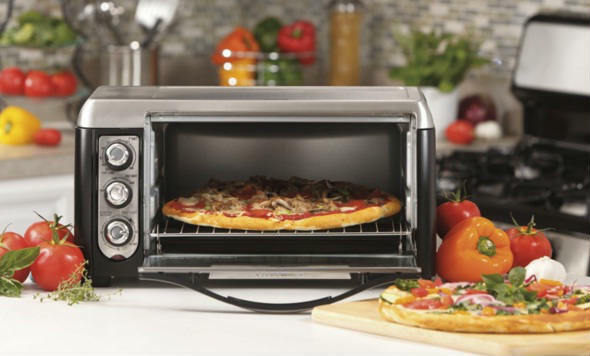 • A toaster oven without convection may be sufficient if you only want to use it to broil or heat up pizzas. • If you prefer to toast or bake bread, a toaster oven with convection will be the correct selection. 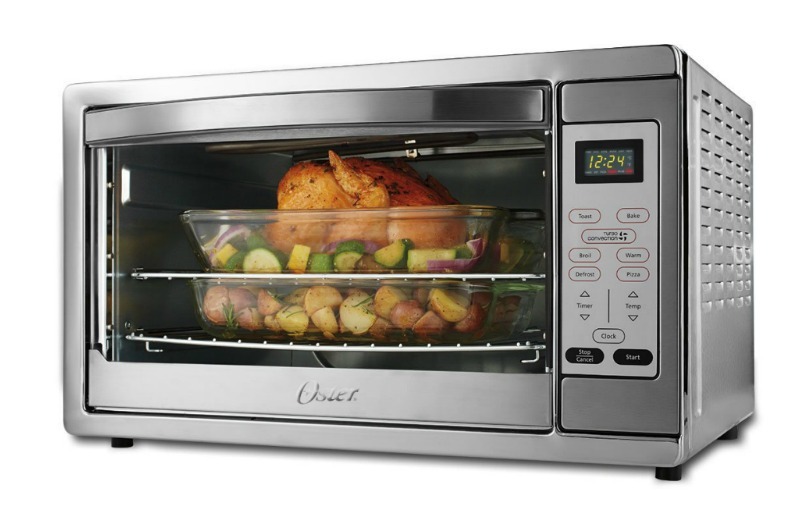 • You can save your money by buying a convection toaster oven instead of your full sized oven. • You should also have to consider about the available space in your kitchen. A toaster oven is versatile with the capabilities it contains. It will help you to cook the perfect dish and provide you with a professional cooking experience. Hopefully, in the next time, this buying guide and the best toaster ovens review will help you to select the best toaster oven that fits your needs. Above all, it’s a smart appliance for your kitchen.